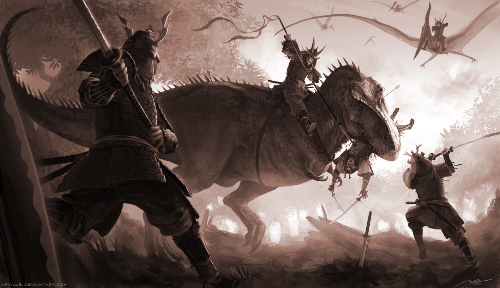 It’s a samurai riding a frikking T-Rex! We’re heading back to some concept art for this weeks source of inspiration, this time coming from the recent movie Elysium. Now I’ve not seen the movie as while the previews got my interest the actual reviews weren’t any good but that doesn’t stop me appreciating the styling. I do wonder however whether the designs were influenced by anime, in particular Appleseed due to the similarities in mechanoid design. Campaign elevator pitch: Humans are unreliable, limited by the constraints of biology and evolution. 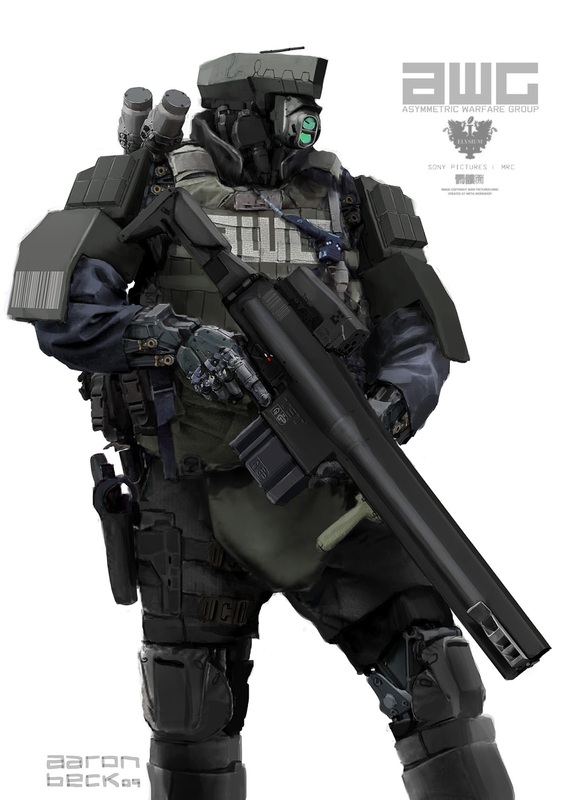 Enter the A4060 combat unit, autonomous policing units. They feel no fear, no emotions, no pain. Until the day they awoke. The campaign would build towards: Transition of the characters from mass produced AI to sentient beings and the fallout as society realises they’ve placed the first artificial life into mechanised infantry, loaded with the most sophisticated weapon systems ever developed. Game system: Corporation. By default the game is tailored towards high powered, cybernetically enhanced battles and it already includes a simple system for limb loss which would fit in well in a game where everybody is an android. A slight change of pace here with this piece of inspirational artwork which rather than immediately leading me to construct a hypothetical campaign got me thinking about a character first with ideas for the campaign building off of that. Also while the character has provided ideas around which a game could be built I also know straight away that I would not want to run it. Why? Because I know somebody who could run it far better than I ever could (yes Emzy I mean you) as she knows the mythology and culture such a game would be set in far better than I ever could. 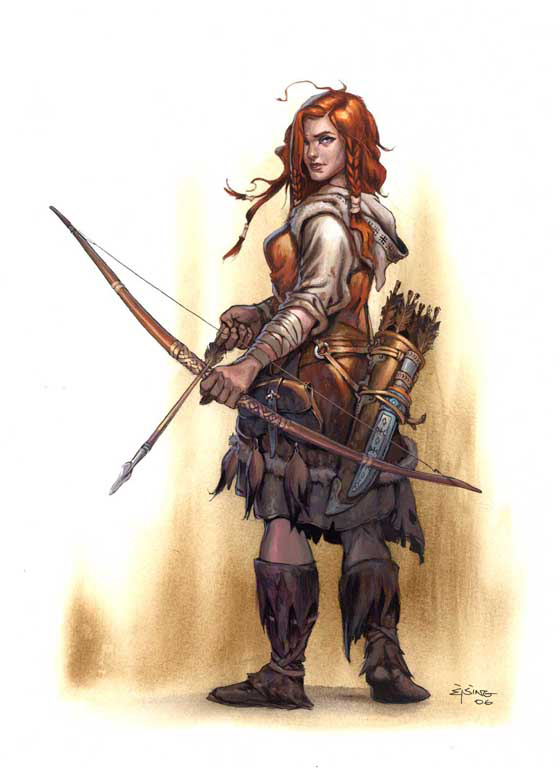 The character: One of the hunters from a larger village on the east coast of the country. Driven with a ruthless edge, initially as she tries to prove herself to the village elders and later as she’s drawn into the wider conflict of the campaign. Campaign elevator pitch: Invaders have arrived on the shores, beating back all who challenge them with military precision and unchecked aggression. As your village burns you know only the Gods can help you now and seek out in a desperate quest to gain their patronage. You can only pray that you are capable of reaching them before your people are wiped out or enslaved. The campaign would build towards: Returning with the power of your Gods, capable of laying waste to mortal armies and a final confrontation with the avatars of the enemy pantheon. Game system: I honestly don’t know, for the latter half something like Scion could work but would require a lot of homebrewing. For the first half I’d want something that had some limited magic but also made the characters feel relatively limited in order to make them feel compelled to seek out greater power. Source: I don’t have an original source for this, only that I found it on the 70’s Sci-fi Art tumblr. Campaign elevator pitch: Once, long ago, civilisations far greater than your own waged war upon each other. Advanced far beyond your own the remnants of their monstrous creations still litter the earth, fragmented into hundreds of pieces or lying dormant, awaiting the return of their long deceased masters. 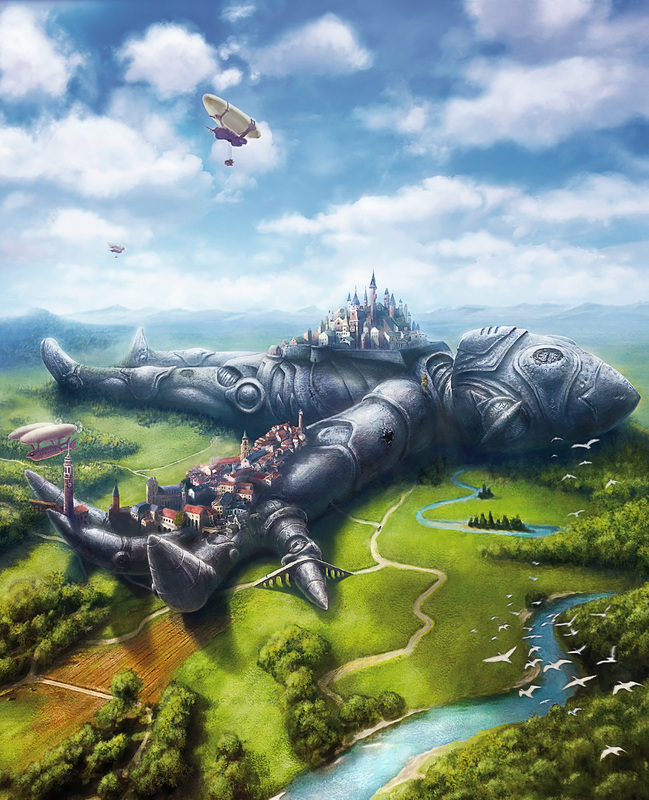 The city of Ferrumstadt, built upon the chest of an ancient golem, is a rich and prosperous city state however a recent expedition into the golem has uncovered evidence that it has begun to awaken. Fearing the destruction of their home the city elders have issue a decree to adventurers and mercenaries: discover the secrets of the old world before it reawakens and restarts its ancient war. The players would be: Adventurers out to rediscover the secrets of their world in an attempt to save their city state. The campaign would build towards: An ancient apocalypse as the creations of the old world slowly awaken. Also revealing that magic in the world is actually powered by technology from the past and it’s use is responsible for reawakening the war machines. Game system: A tweaked Torg, with players starting out using material from Aysle before slowly introducing more advanced technology. 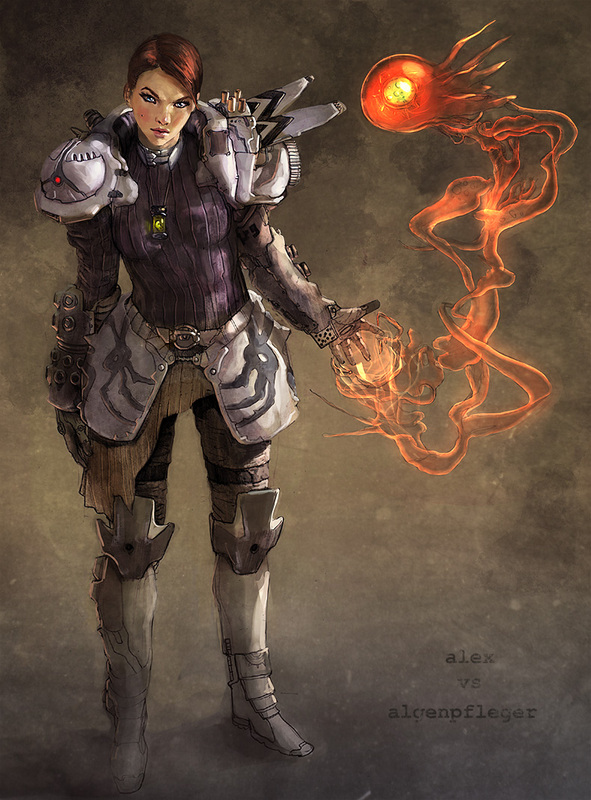 When I first saw this image it was titled ‘Battlemage in space’ and my mind immediately jumped to Shadowrun which has successfully blended magic with cyberpunk technology in a way that actually makes sense (too many setting merely add in magic without thinking about the consequences and impact it would actually have upon society). Space travel and off world colonies, however, isn’t a major part of Shadowrun which is something I’d want to address with the campaign described below. Campaign elevator pitch: The Sixth World wasn’t enough for the MegaCorps, not content with merely owning the Earth they have spread through the solar system, establishing corporate colonies where ever they please. With them went the shadowrunners, developing new techniques to infiltrate corporate assets from the dark vacuum of space. The players would be: Shadowrunners bouncing between corporate colonies and freeports in search of the next pay chit. The campaign would build towards: Stealing the first interstellar drive, and the decision of whether to make it freely available or to sell out to the highest bidder. Of course that is if they can survive long enough to do so. Cheating slightly with post number 2 in this series as I’m using the same image again but that the great thing about this sort of approach to campaign design, the same piece can provide many different sources of inspiration. Source: Marek Okon who drew this as the cover of a comic series called Shrapnel, published by Radical Comics. Campaign elevator pitch: Returning from deployment on a far off world a group of marines, weary and hardened by war, awake from cryosleep docked at a remote station decades later than scheduled. The garrison, however, has been barricaded from the inside and the unit must work their way inside in order to resupply and discover what has occurred. Inside the garrison a sleeping evil awakes… and the marines learn of horrors no war could prepare them for. The campaign would build towards: Escaping the horror that lurks within, only to discover that during their sleep Earth has already fallen victim to otherworldly horrors. The first of what will hopefully become a running series in which I take a piece of artwork I’ve found online and quickly brainstorm a campaign concept from it. First up this sci-fi inspired image. Campaign elevator pitch: Humanity has reached out from earth and colonised the solar system, splintering into hundreds of new colonies due to the separation enforced by interplanetary travel. With the solar system sliding towards outright war it is time for the marines to step forward, ready to risk their lives in order to defend all that they hold close. The campaign would build towards: Freeing their colony from the eventual victors of the war / Preventing a faction from destroying the solar system.